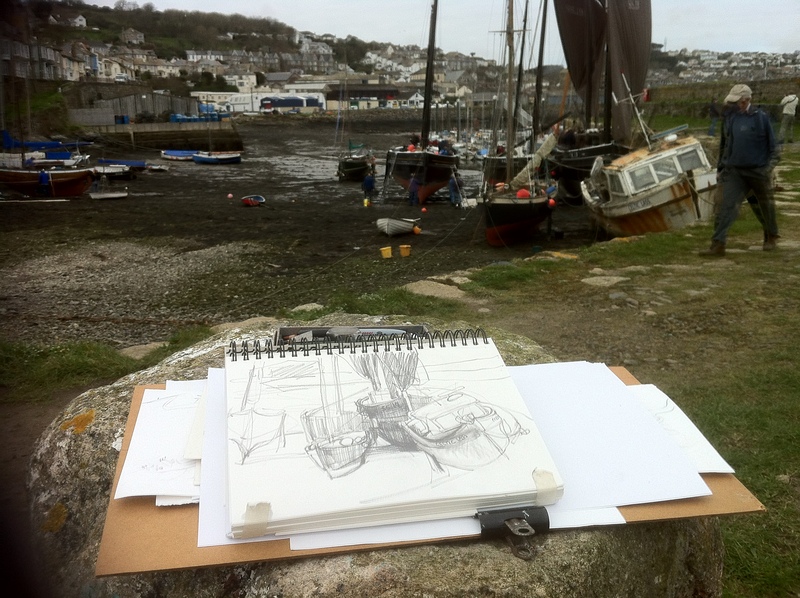 I’ve just spent a glorious day down on Newlyn Old Harbour drawing the Mounts Bay Luggers. Arriving before the crowds, I was greeted by one of the old Cornish sea-dogs with his handsome swarthy features and sun-tanned face framed by a white-spotted, crimson handkerchief tied around his neck. He told me he had helped crew ‘Ripple’ from her mooring in Penzance to Newlyn the previous evening, on one of the biggest tides of the year. 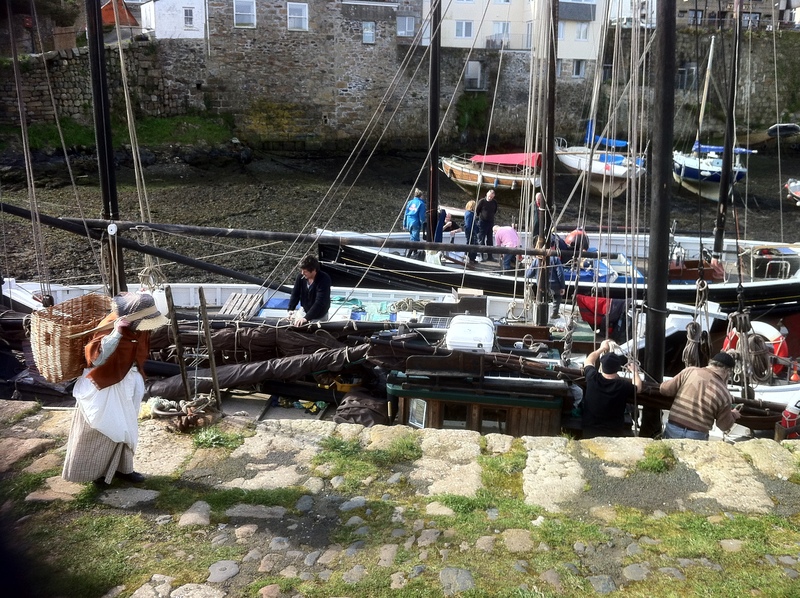 The Painting Party, organised by John Lambourn, the skipper of 116 year old ‘Ripple’ after last year’s success, to encourage artists and photographers down to the old quay to mark the start of English Tourism Week. He also obligingly put up his sails so that we could appreciate the old girl in all her glory. To add to the authentic atmosphere of times past, a diminutive woman, dressed in the costume of a traditional fish-wife, was added to the scene and was walking around the quay with a basket (sadly empty of pilchards) strapped to her head and willing to pose for anyone who cared to take her picture. The event was well attended by artists, photographers and visitors alike. Despite the warming sunshine, I had to dive into the pub overlooking the harbour half way through the day and thaw out with a bowl of Newlyn Crab Soup which wasn’t such a hardship. I managed to get lots of drawings done, however, (before my fingers ceased to function with cold), which I would like to take further. As the tide came in and ‘floated my boat’, I took my leave.